Today we are leaving Santa Cruz for San Joaquin County. Instead of concrete arch and haunched girder bridges there are a lot of movable bridges and railroad bridges. 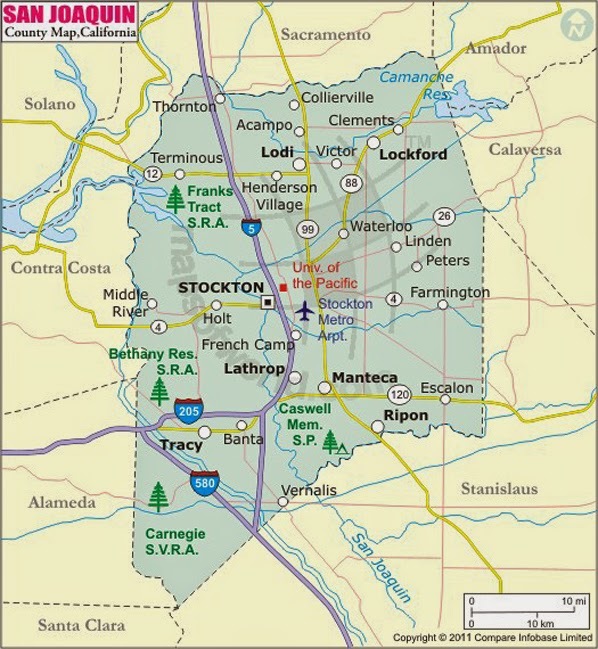 San Joaquin County is between the Bay Area and the Mountains and has many rivers, expressways, and railways crossing its borders. I couldn't find much written about today's bridge. The Forest Lake UP (29C0132) was likely built at the beginning of the 20th century. Although it has a concrete facade, it is actually a two span steel girder bridge. When it was built, there must have been pedestrians who found it convenient to walk under the 14 ft long western span while horse drawn vehicles used the 23 ft long main span. The surrounding area has changed but the bridge remains the same. While I was photographing it several freight trains crossed over the spans. San Joaquin County, California Bridges: Forest Lake Underpass across Lower Sacramento Road by Mark Yashinsky is licensed under a Creative Commons Attribution-NonCommercial-NoDerivatives 4.0 International License.